Maltreatment of prisoners by the United States did not begin with the Iraq War in 2003. Consider the Union Army’s placement of Confederate prisoners of war as human shields in 1864. Lieutenant William C. Cherry was one of these men. Here is how this episode came about. The Union army pushed to capture Charleston, South Carolina, in 1864. The United States Government had a special desire to take Charleston, where secessionists had provoked the war in 1861. The narrative that follows is taken largely from the book Immortal Captives, The Story of Six Hundred Confederate Officers and the United States Prisoner of War Policy, by Mauriel Phillips Joslyn (Shippensburg, Pa.: The White Mane Publishing Co., Inc., 1996)[cited as Joslyn]. Two other books have covered this episode in the war: J. Ogden Murray, The Immortal Six Hundred, A Story of Cruelty to Confederate Prisoners (Winchester, Va.: The Eddy Press 1905)(reprinted by Forgotten Books, 2012); and Karen Stokes,The Immortal 600 – Surviving Civil War Charleston and Savannah (Charleston: History Press 2013). Major Murray was one of the 600. Miss Stokes is an archivist with the South Carolina Historical Society. The Union had failed to take Charleston up to the summer of 1864. Fort Sumter remained in Confederate control in the entrance to Charleston’s harbor. In May, a new commander took over the Union Department of the South. 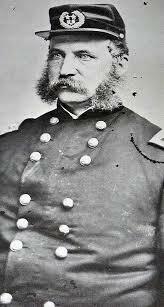 He was Major General John G. Foster, an 1846 graduate of West Point. Foster had served at Fort Sumter under bombardment during the outbreak of the war. Foster began with massive shelling of Fort Sumter – now garrisoned by the Confederate Army. That also failed. Then Foster decided on a five-pronged offensive by Union forces to retake Fort Sumter. “[Foster] was determined to crack Charleston, and Fort Sumter was the jewel in that crown of secession,” wrote Joslyn, pp. 6-7. The Confederate command contained fewer than 6,000 soldiers, but the Confederates repulsed all five attack by the Union in July 1864. “Perhaps,” Mrs. Joslyn writes, these failures begat in Foster’s mind a policy of retaliation against prisoners of war. Retaliation was intended to pay the South back for mistreatment of Union prisoners at places such as Andersonville. Never mind that the 600 Southern prisoners had nothing to do with Andersonville or Union prisoners. There had certainly been talk of retaliation in the North. Demands for retaliation even reached the United States Senate in January 1865, Joslyn writes, when Senator Henry Smith Lane reported a request from the citizens of Fort Wayne, Indiana, to retaliate against Confederate prisoners because of stories of cruelty to Northern prisoners. Joslyn, p. 37. Rebel prisoners in our hands are to be subjected to a treatment finding its parallels only in the conduct of savage tribes and resulting in the death of multitudes by the slow but designed process of starvation and by mortal diseases occasioned by insufficient and unhealthy food and wanton exposure of their persons to the inclemency of the weather. Six months before this resolution reached the Senate, General Foster had put such a policy in effect at Charleston. And in January 1865, the resolution for retaliation passed the U. S. Senate and became public policy of the United States. There is apparently no record of Foster’s correspondence, but the inference is overwhelming from the months of torture after August 1864 that Foster ordered severe punishment even if it resulted in death for the prisoners. Curiously, Foster has remained a hero in his home town of Nashua, New Hampshire. And his Wikipedia biography ignores his role in the maltreatment described in these three books. Even during the Civil War, international law required the imprisoning government to protect all prisoners, and furnish them proper quarters, clothing, and bedding. Under international law, a prisoner had the right to the same rations as those of the capturing army. Joslyn, p. 9. The North evaded these requirements at first by denying that the Southerners were prisoners of war. The United States refused to recognize the Confederate States and refused to exchange prisoners as international law required. When Lt. William C. Cherry landed at Fort Delaware in the summer of 1864, he went into officers’ wooden barracks built around Fort Delaware on Pea Patch Island. Enlisted soldiers had separate quarters. Life at the prison was harsh but not .dangerous – except for disease. All this changed on the orders of General Foster in Charleston. On August 20, 1864, the War Department, which had selected 600 Confederate officers at Fort Delaware for retaliation, loaded them onto the Crescent City, a side-wheel steamer that in peacetime had plied between New Orleans and Galveston, Texas. Lieutenant Cherry was one of the 600. The New York Times published the list of prisoners sent to Charleston Harbor. The Union had refitted the ship to transport prisoners. The second deck, which lay between the top deck and the hold, contained shelves four tiers high with two feet of space between them. Each shelf made up a bunk for four men. The War Department crowded 600 men into the hold. Joslyn, p. 63. The books all quote a profusion of letters and memoirs and other primary sources, from which I draw this description. My bunk, which was about five feet ten inches square, and occupied by four persons, was right against the boiler, occasioning an additional amount of heat, which made the sensation of suffocation almost unbearable. Here we lay in these bunks . . . in the hottest part of the summer. Only one hatch was left open, so that the place was very close and dark. The August heat was intense even on deck. Imagine the situation in this foul hold, near the steaming boilers and glowing furnaces, with six hundred men, already enfeebled by close confinement, sweltering and gasping for water, which was doled out hot from the [sea-water] condensers. Lieutenant Cherry seems not have realized that he was a member of the Immortal 600. At least he never mentions it. Writing twenty years after the event, he recalls only 175 prisoners. But he does recall the Crescent City’s running aground north of Charleston. In the fall of the same year , I was drawn as one of 175 to be retaliated upon. We were placed on a prison ship and started with a convoy for South Carolina. We ran aground on Cape Romaine of the South Carolina coast, and we talked about rebelling and came near ordering it. We got off, though, without serious accident and went into Charleston Harbor in due time. The ship ran aground on the South Carolina coast about 3:30 in the morning of August 24. The escorting convoy waited at sea, and the prisoners convened a council of war and decided to seize the ship. Three Confederate colonels and a major went on deck and demanded that the captain of the Federal guard surrender the ship. He first agreed, but then Union gunboats appeared and the rebellion collapsed. Joslyn, p. 68-69.
had permission to have a stateroom on the ship. Aboard the Crescent City was an old colored woman who had belonged to the Woolfolk family . . . She was the stewardess of the ship. She recognized Colonel Woolfolk, her young master, and determined to help him to escape. She took him into her linen room, hid him under the bed, and fed him. . . She kept him concealed on board until after the ship had landed [the prisoners]. . . When the ship reached New York City the old woman smuggled him ashore and gave him money. He succeeded in getting to Canada, from there to England, and back to the South on a blockade runner. . .
Joslyn, pp. 70-71. The rest of the prisoners, however, found themselves confined again below decks. Captain Webster of the guard detachment ordered the portholes closed in the hold so that now there was neither light nor air. Joslyn, p. 75. [E]very morning, nearly all of the 600 would line themselves around the vessel in two ranks . . . Many of [the men] were not able to stand up in ranks till their turn came, owing to their enfeebled condition caused by sea-sickness, which was aggravated by the heated and fetid air which they were compelled to breathe. . .In many instances these people were not able to control themselves, and were compelled to leave ranks and use one end of the hold for their purposes. . . When the vessel encountered the rougher waters off Cape Hatteras, its rolling and pitching would dash and splatter this horrid combination from one end of the hold to the other. For eighteen days we were kept in this miserable place, which notwithstanding the filth necessarily accumulating each day, was never cleaned. . . .
At last, on September 7, the prisoners went ashore at Morris Island. They immediately found themselves under fire from the Confederate batteries in Charleston Harbor.